A Springsteen Odyssey is an ambitious effort to tell the story of one Springsteen concert, from one fan's perspective. What makes it ambitious is that it is twenty-six parts long, one part for each song played by Bruce Springsteen and the E-Street Band that night, with each song helping to tell one part of the story. Taken as a whole, they provide a comprehensive picture of a fan's relationship to an artist and his music, but each part also stands completely on its own. This is part 2 of 26. You can read part 1 here. “One, Two, Three, Four!” Weinberg picks up The Boss’s count with the drumbeat and then, after a trip and a tumble around the drum kit, the rest of the E-Street band comes spilling in behind him. It takes a moment, but only a moment, to place the song. “No Surrender” from Born in the USA. The song feels a bit sluggish at first, kind of sloshy. It strikes me that the band needs a little time to tighten up and find its groove, the same way a team of horses might need a minute or two to establish a unified rhythm, to work out the relationships and the timing between themselves. Of course, I know next to nothing about horses. Or bands, for that matter. Springsteen’s voice makes the drastic transition from the soothing lullaby of “Surprise, Surprise” to the rasping, tobacco-spitting vocals of this song seamlessly. The band, however, still feels to me like they’re trying to warm up while they catch up. I can hardly believe my own reaction. “No Surrender” is a good song, at least I remember it being a good song. But in this moment, slow start or not, the song seems to be falling flat. I wonder at my lack of responsiveness, my strange, unrepentant apathy. What is this? Have I suddenly developed an immunity to Springsteen? Has my lackluster memory of the only other Springsteen concert I’ve ever seen somehow poisoned me over these intervening years without my even realizing it? Forget the band; maybe I was the one who needed a little warming up. I tried again, listening harder. How can this be? This is Springsteen and the vaunted, effing E-street band we’re talking about. I should be amped, I should be psyched, I should be busting at the seams. This is why I’m here, to hear and see it all live and in person. So why is this song in danger of being drowned out by the deafening Meh coming from inside my head? It’s baffling. Remember how huge Born in the USA was? I was sixteen in ’84, the year that album was released. The album took the over the country, the way Michael Jackson’s Thriller did two years before. It pretty much became the national soundtrack, starting in the summer of ’84 and blazing non-stop through a whole junior year of high-school life and then right on through the summer of ’85. Song after song after song catching fire, flash-burning across the airwaves, and charring the pop charts. 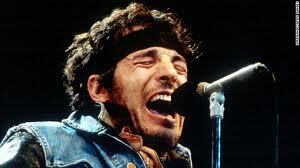 Springsteen, and Born in the USA, were everywhere. Looking back, it was the right record at the right time. The country was just coming out of the prolonged unresponsive coma of the Carter and early Reagan years. The economy was on the move, and the deep, festering wounds from Vietnam and Watergate were finally beginning to close over, if not heal. The Olympics were in L.A. that summer, and it seemed like the whole country was full of pent-up desire, ready to rally around something, anything. Along with the Olympics, Born in the USA was that something, and when it entered the atmosphere it combusted like a spark in pure oxygen. It didn’t matter what the songs were really about, or what lyrics actually said; it was the music: that driving, defiantly upbeat, energetic, bright, muscular music that mattered. 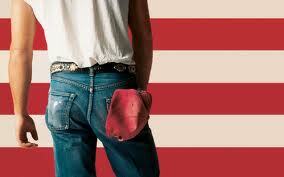 It was the iconic image of blue jeans, and baseball cap, and flag. It was the image of a man, clean and strong in mind, body, and spirit, seeming to find joy in what he was doing, showing it in his voice, and in his smile, and the music videos that accompanied the songs. Born in the USA served to catalyze America’s long years of gloom and frustration into a pride of country and a nationalistic fervor that would have been hard to even imagine ten, five, or even two years earlier. And I was right there with it. I had my own copy of Born in the USA, and it was in heavy rotation on my turntable for a long time. I worked out in my room to those songs, trying to build my body into one like Springsteen’s (unsuccessfully, need I say?) I must’ve played the whole album at least a hundred times, and that’s on top of hearing many of the songs repeated ad infinitum on the car radio, or playing from someone’s boombox, or on our clunky old Walkmans. So how could I be at all disappointed that The Boss was performing this song now? Yet I was. I felt totally disconnected from the song. And still at a loss to understand why. Here’s something interesting about my copy of Born in the USA. I still have it, the original vinyl LP I bought back in ’84 with the earnings from my first real job as a stock-boy at Lionel Playworld. I have the record, packed away in a storage box, even though I no longer have a turntable, and haven’t had one for the last twenty years. In this age of binary code, of MP3’s and iTunes and instant downloads, I don’t own an electronic copy of Born in the USA. As I write this, I couldn’t even listen to the album without visiting Amazon.com first. And the truth is, I’ve never, ever really missed it. Was it simply a case of overkill? Too much of a good thing? It would be natural to think so, but there are other albums I’ve listened to just as much, other Springsteen albums in fact, whose music I still seek out and draw personal meaning from and continue to need. I’ve heard the entire album Born to Run as many times as I’ve heard any song on Born in the USA, and it still blows me away like nobody’s business. I was so enamored with Tunnel of Love when it came out that it was one of only a few albums I can recall actually purchasing three times: on vinyl, cassette and CD. I still come back to that album from time to time, and certain lines from it never fail to devastate me. But there is very little intimacy between me and Born in the USA. It was like we were friends once, this album and I, but we had grown in different directions since those days, and had become, in some unfortunate way, less than strangers. All the more unfortunate because there was no detectable sense of regret at the loss of the friendship. Hearing “No Surrender” in concert forced me to realize, though it wasn’t until long after the concert was over, that the song, like the album it came from, failed to make a lasting, personal connection with me. I’m not sure I understand how that’s even possible. I don’t know if it has everything to do with its immense popularity and pervasiveness, or nothing at all to do with it. A little or a lot. I only know that, for some reason, Born in the USA didn’t pierce the external shell of my world, find the small places where I live, crawl in, and then refuse to leave. I’m as surprised as anyone by this revelation, but how else do you explain owning an album that you couldn’t even listen to for twenty-some years, and doing nothing about it? I decided that my Meh reaction during the show was the result of me running into the cold, hard truth that “No Surrender” existed within me only as a lifeless, desiccated artifact from another time. It's weird and unexpected, but I guess things like that happen. But that night, the net effect was that, after only two songs, I was confused, and discouraged, and filled with the very uncomfortable feeling I may have made a big mistake. I blamed myself, believing that I must have subconsciously allowed my expectations to get too far out of whack, and now the whole evening was going to be one long letdown. Three more hours of this kind of disappointment? I didn’t know if I could take it. Fortunately for me, however, the concert was only about to start, and the E-street band was just now coming over the horizon. You can read the first part, about the song "Surprise, Surprise" here.